Unanswered question: How did Alan Grayson know about this meeting? Who informed him? Was this staged? Matthew Falconer, candidate for Orange County Mayor, quickly challenged Alan’s rudeness. Grayson demanded not to be interrupted, but Falconer quickly reminded the congressman that he is in fact interrupting their meeting. Currently, there are 12 Republican candidates looking to send Alan Grayson to the unemployment line in November. When Tillison reminded Congressman Alan Grayson that these are the people who pay your salary, Grayson said, “There are 308 million people that pay my salary. Do you know what that breaks down to per person?” After Tom shrugged his shoulders insinuating ‘I don’t know’, Grayson repeatd the question with emphasis. Tom quickly replied, “I have no idea, Alan, why don’t you tell me”. “It’s pennies on the dollar”, said Grayson. He later said, “I took a pay cut when I took this job”. Grayson threatened Falconer by saying that he’ll spend thousands of dollars making sure he doesn’t get elected. Question: Is it legal or atleast unethical for a sitting congressman to threaten to influence a local election? Why is Matt Falconer, running for local Mayor, even on the radar of Alan Grayson? As I was sitting with Orange County Republican Chairman Lew Oliver, I stood up to Grayson and demand he apologize to Lew for the vial comments he made recently (Grayson said “Lew Oliver could not find a $20 bill if it was stuck in his A**”). Grayson yelled at me for interrupting him when I reminded Grayson he was interrupting our meeting. Fortunately, one of the attendees grabbed their phone and recorded Alan Grayson displaying his class to his constituents. 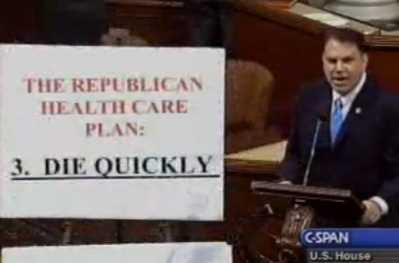 In another video, Alan Grayson (at 3:00 in the video) challenged the female recording the video and abruptly leaves. Question to be answered: How did Alan Grayson hear about the meeting?